The picturesque Chapelle St Nicholas where Pont St Benezet spans the Rhone River at Avignon in Provence, France. Photo of Pont St Benezet and Chapelle St Nicholas at Avignon in Provence, France. 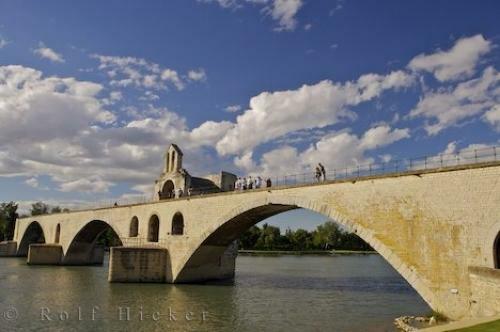 ... the original twenty-two arches of Pont St Benezet remain, but visitors to the bridge and Chapelle St Nicholas can find images of the old bridges in the museum close by.Pont St Benezet and the Chapelle St Nicolas on the Rhone River, Avignon, Vaucluse, Provence, France, Europe.